3. Small baby chicks- A natural diet for ferrets can include small baby chicks, and this food offers mental stimulation as well as nutrition. 4. Raw liver- Raw liver can provide a lot of protein and other nutrients to any ferret diet, but this food should be given in moderation. Make sure you remove any uneaten liver after a short time so it does not spoil in the cage. 5. Beef- What do ferrets eat? A Lot of protein and fat, and beef has both of these components. Meat based proteins like beef are essential for a healthy pet that has a good life. 6. 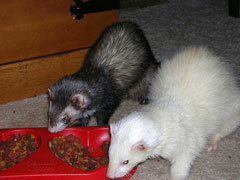 Chicken- Chicken is one of the top foods included in any ferret menu. Do not give the ferret the small bones though, and the meat should be cooked to ensure no parasites or other organisms can infect your pet. 7. Pork- Pork including ham and other types can be included in your ferret diet, and your pet may enjoy it immensely. Pork is high in fat and protein, the two main nutrients that your ferret needs on a daily basis. 8. Turkey- One of the ferret facts that concern diet is that turkey can be a great food, but just like chicken you should remove any small bones that could cause choking or become stuck. Your ferret will enjoy the taste, and turkey is very nutritious. 9. Lamb- Many ferret diet products contain lamb because of all the nutrients and fat that this meat offers, and lamb meat is very beneficial to your pet. 10. Eggs- Eggs can be ideal ferret food, because of the high protein and cholesterol content that this food offers.